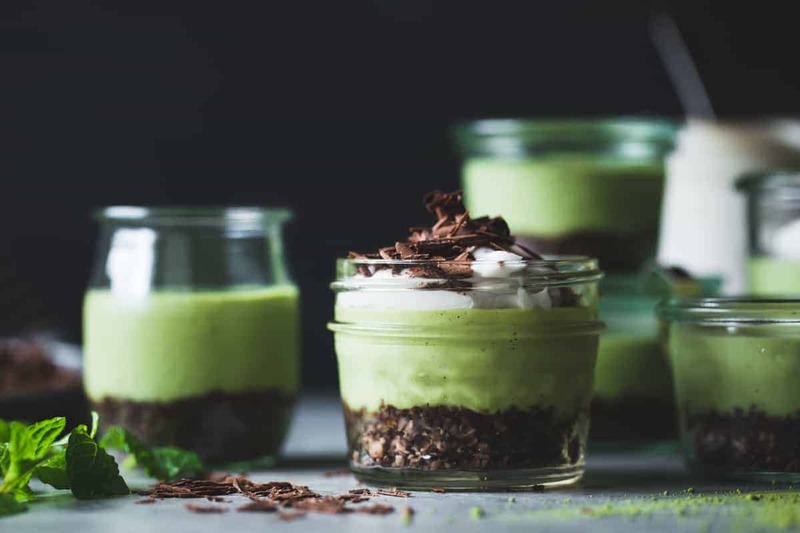 Grasshopper Pie gets a stupid-healthy update from cashews, coconut, matcha, fresh mint, and an almond-cocoa crust. Gluten-free, vegan and optionally refined sugar-free. ‌‌Pi Day is the best holiday, amiright? It’s a holiday where math, pizza, and pie lovers unite. No matter that I’m about as adept at math as I am at training my cat not to eat my cookies, my love of pie more than makes up for this fact, and I’ve been plotting and testing these green beauties for the past few weeks. 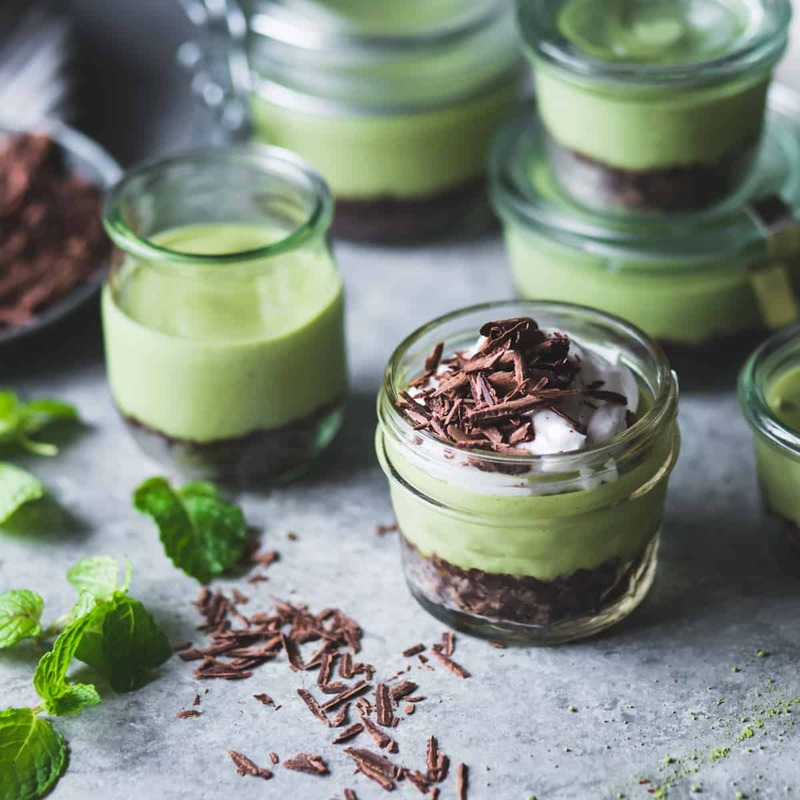 So it is that I bring you these little pies in jars infused with fresh mint, matcha, and a crumbly almond-cocoa crust topped with minty coconut cream and chocolate shavings. Math be damned, we’re 100% hooked. But full disclaimer: I’ve never had legit grasshopper pie. Regardless of whether eating insects is the future, the name is revolting. The ingredients – Oreos, marshmallow fluff, gelatin, and creme de menthe – are the same. But chocolate, mint, and cream? I’ll take those in (just about) any form. Grasshopper pie hales from the cocktail of the same name, and both stem from the era of jell-O salad, meatloaf, and Ham and Bananas Hollandaise, sometimes known as the “temporary insanity era of cooking.” True to its jell-o-molded brethren, grasshopper pie has a chiffon filling of airy custard set with gelatin. 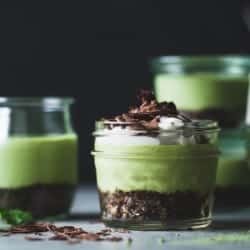 The custard is infused with bright green Creme de Menthe liqueur, chilled in a chocolate cookie crust, and smothered in whipped cream. I’m sure the taste is more delicious than the ingredient list, but I wasn’t about to find out, lest I end up like Evan Symon, a.k.a. Martha Stewart of the Damned. The idea for this more wholesome version came to me one day at Sarah’s as we discussed various uses for matcha, and we cooked up a plan for these uncooked pie-lets. Instead of the usual gluten-sugar-dairy-egg-gelatin-fest, I kept the whole thing ridiculously healthy, basing it on these chocolate cheesecakes which I adapted from Comfy Belly (and is one of this site’s most-made recipes to date!). 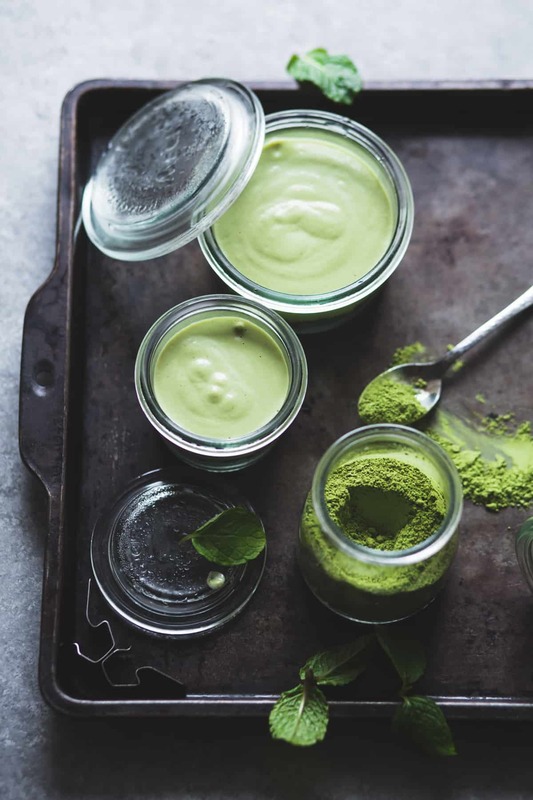 Matcha adds color and bittersweet, vegetal notes, and coconut oil helps the filling set. Straining the filling through a sieve isn’t the most fun thing you’ll do in the kitchen, but it beats marring your silky-smooth masterpiece with stringy leaves. I speak from experience. Once the pie-lets have chilled, I top them with whipped coconut cream kissed with a few drops of peppermint extract, and shower the whole thing in chocolate shavings. 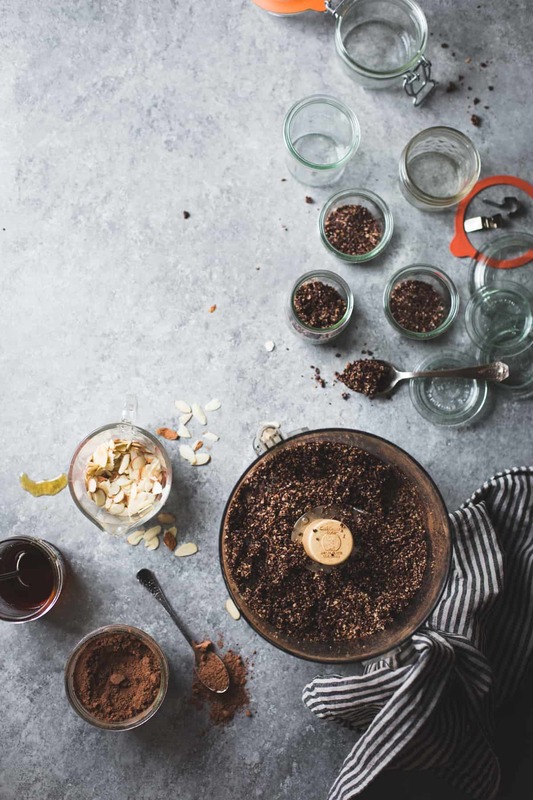 Dig into a finished pie (or “grasshopper,” as Jay has taken to calling them) and your spoon will slice through a layer of flaky chocolate, a puff of coconut cream, a creamy green filling, and a crumbly chocolate crust. Slip a bite in your maw and the taste of fresh mint hits you first, followed by rich chocolate, a little je ne sais quoi from the matcha, and a nubby, nutty crust. 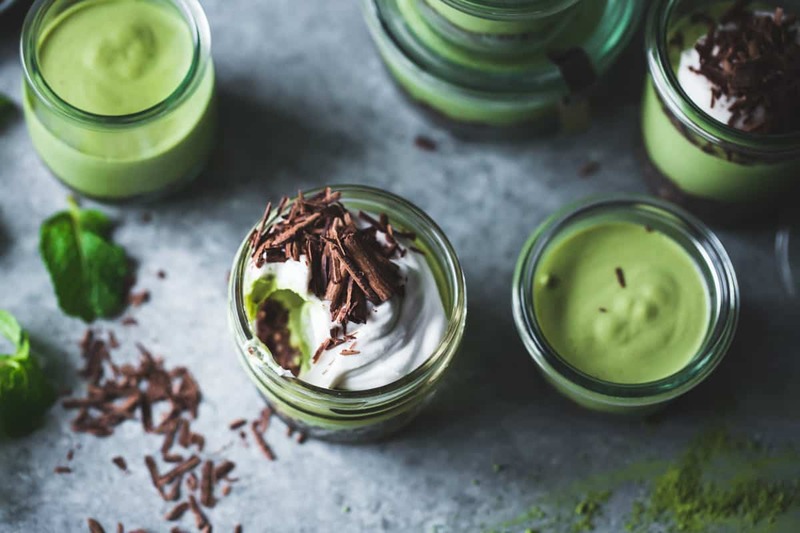 Unlike the grasshopper pies of yore, these are full of good-for-you fats from nuts and coconut, antioxidants from cocoa, mint, and matcha, and they come together in a snap, no oven required. They’re not unlike a chocolate matcha mint cheesecake. I think the recipe could be doubled and shaped in a 9″ pie pan or springform pan to feed a crowd. …but I’m not about to find out. ‌Thanks for reading! If you make this, I’d love to see. Take a photo and tag me on Instagram @The_Bojon_Gourmet and #BojonGourmet. 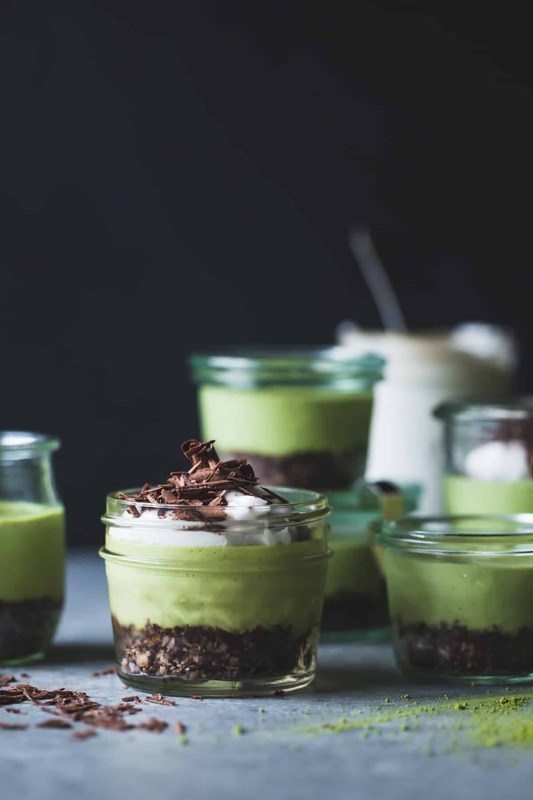 Grasshopper pie never looked so healthy and adorable. 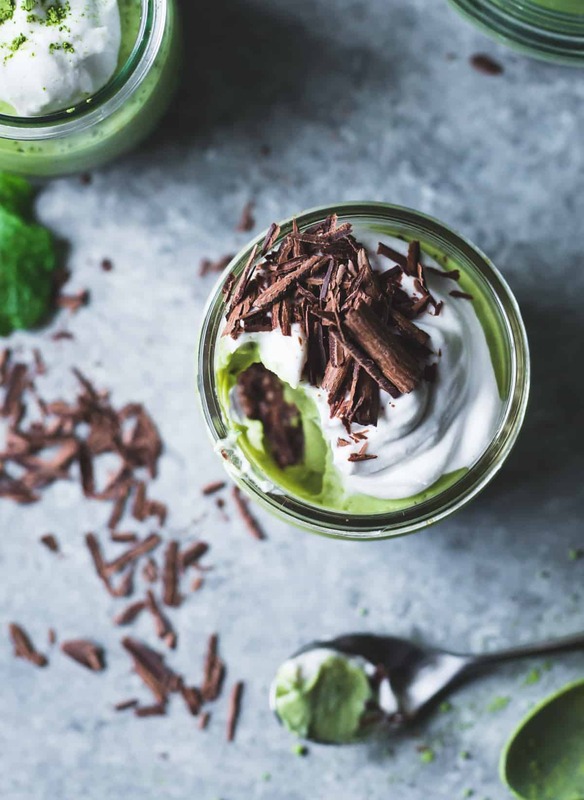 Cashew cream, coconut oil, almonds, and maple syrup make a silky-smooth filling kissed with fresh mint and matcha, all topped with peppermint coconut cream atop a nutty cocoa crust. Don't skip the steps of blanching and shocking the mint or pushing the filling through a sieve to remove the mint particles. I like using my super-fine, funnel shaped sieve called a chinoise for the silkiest filling. 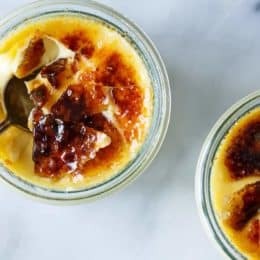 If you can't find coconut cream, chill a can of regular, full-fat coconut milk overnight and use the solid cream that forms on the top of the can. Light maple syrup (grade A amber) lets the other flavors come through best. 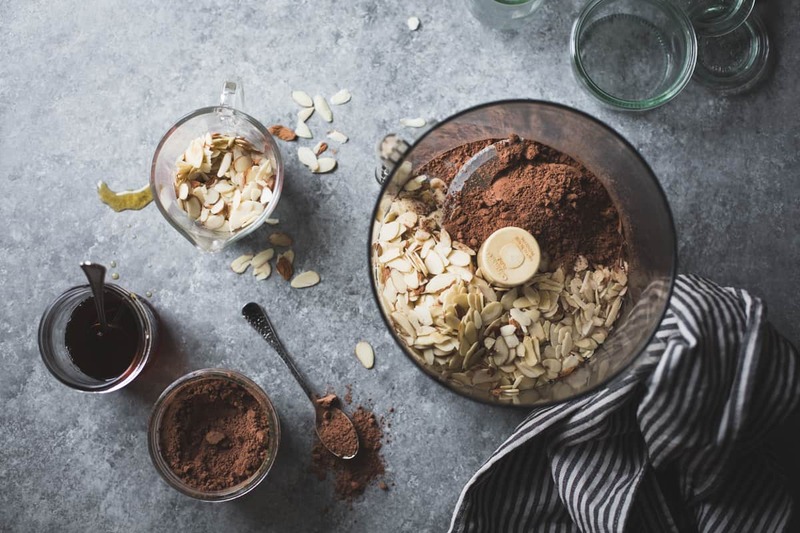 In the bowl of a food processor, process the almonds, cocoa powder and salt until the almonds are finely ground. Drizzle in the maple syrup and pulse until the mixture clumps together lightly. 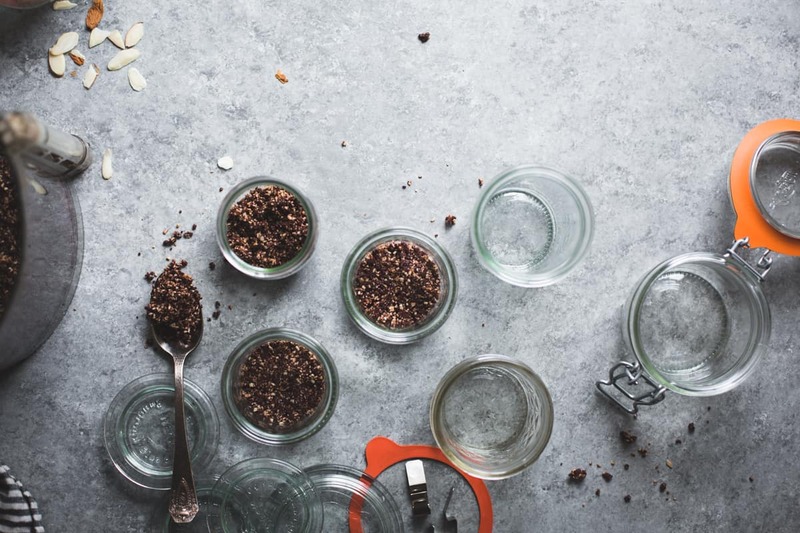 Divide the crust mixture among 4 (8-ounce) or 8 (4-ounce) jars or cups and pack gently; the crust mixture is easier to eat with a spoon when slightly loose. Rinse and drain the cashews and place them in the bowl of a blender with the ground chia, salt, maple syrup, and half of the water. Blend on low, gradually increasing to high, gradually adding the remaining water. Blend on high for 2-3 minutes until silky-smooth, scraping down the sides of the blender as needed. If the mixture is warm to the touch, let it cool before proceeding to the next step – we want to keep the mixture cool so the mint doesn't oxidize. Bring a small kettle of water to a boil. Prepare a small ice bath by combining several ice cubes in a medium bowl with cool water. Place the mint leaves in a strainer, place the strainer over a bowl, and pour enough boiling water over the leaves to just wilt them, about 1 cup. Immediately dump the mint into the ice bath and stir until the mint is icy-cold, 1 minute. When the cashew mixture is ready, drain the mint, squeeze out excess moisture, and add to the blender along with the matcha powder. Blend on medium-high until the mint is broken down into tiny pieces. Add the melted coconut oil and blend until just combined; don't over process or the mixture could become grainy. Place a fine mesh strainer over a large measuring pitcher or bowl and pour in the filling; it will be thick. 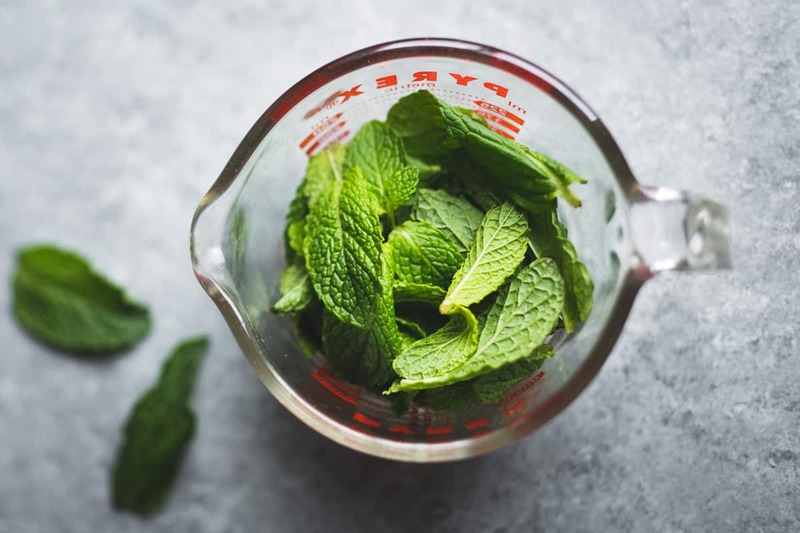 Vigorously work the mixture through the strainer with a sturdy silicone spatula, pressing on the mint leaf dregs to extract all the good stuff; it will take a bit of effort but the silky-smooth results will be worth it! Now pour the filling into the jars over the crust. Cover and chill the jars until the filling is firm and set, 3-4 hours and up to 2 days. Without tilting or shaking the can, remove the coconut cream from the refrigerator, open the can, and scrape the top creamy part into the bowl of a stand mixer fitted with the paddle attachment. Add the maple syrup and peppermint extract (a little goes a long way!) and whip until the mixture holds soft peaks. When the pies are firm, remove from the refrigerator, top each with a dollop of cream and handful of chocolate shavings, and serve. The pies keep well for up to 3 days. These couldn’t be lovlier or more tempting!!!! 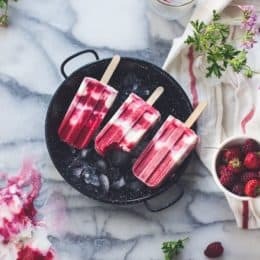 These look delicious, so creative, perfect for Spring!!! I am seriously mad at myself. I don’t make pie often but the ONE time I did..I posted it last week. Because I forgot about pi day! BUT that means I have more room to eat these pies! i LOVE that you made the classic healthier. Pinned! This is such a great idea for Pi Day! I am never on top of these things… I wish I had a pie to post today. 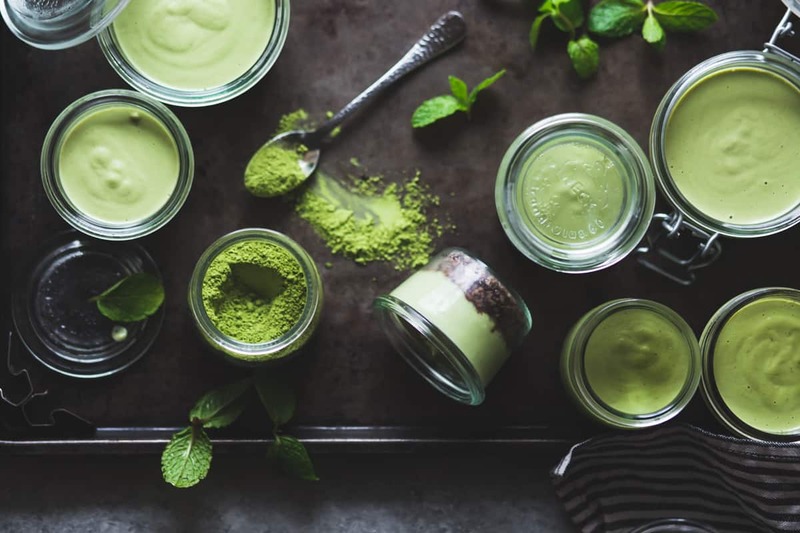 Your and Sarah’s matcha creations are divine; your collaborations always end on a spectacular note! 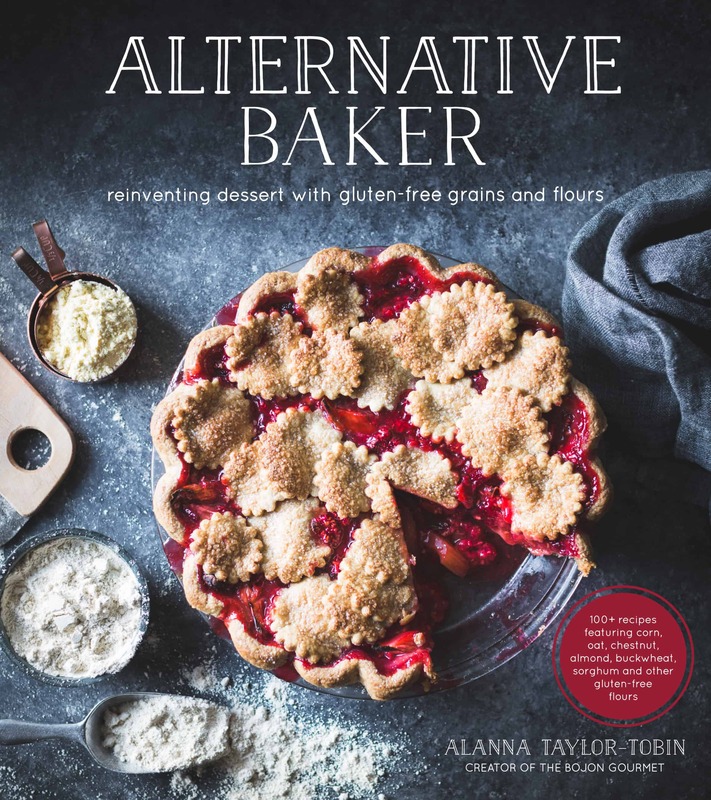 I love it when classics can be turned into something much healthier and tastier and you’ve done it with this sweet little number, Alanna! I’ll take this over the classic any day! Just perfect! Thank you for this! Oh my god it’s PI DAY. I totally forgot! 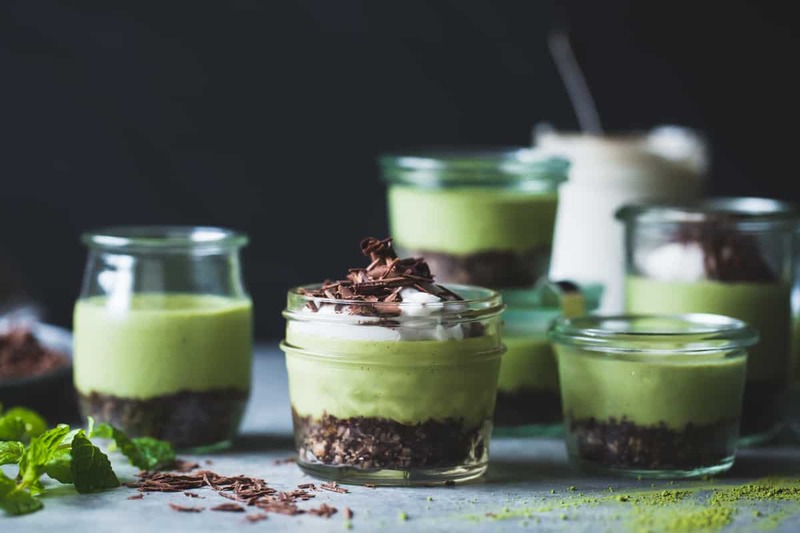 As someone who doesn’t love the typical fruit pie, these matcha mint babies are the perfect way to celebrate. Thanks so much for making a healthier version of a classic dessert. There ARE those of us who don’t like Oreo cookies or Creme de Menthe! And it’s just so beautiful, too. These look so good! And fun to eat too! I’m going to try this with my little one – I think he would have fun assembling them! What an awesome recipe and that color is so cool!! Love your photography! And these look super delicious, love the combination of green + chocolate. Could have one right now! 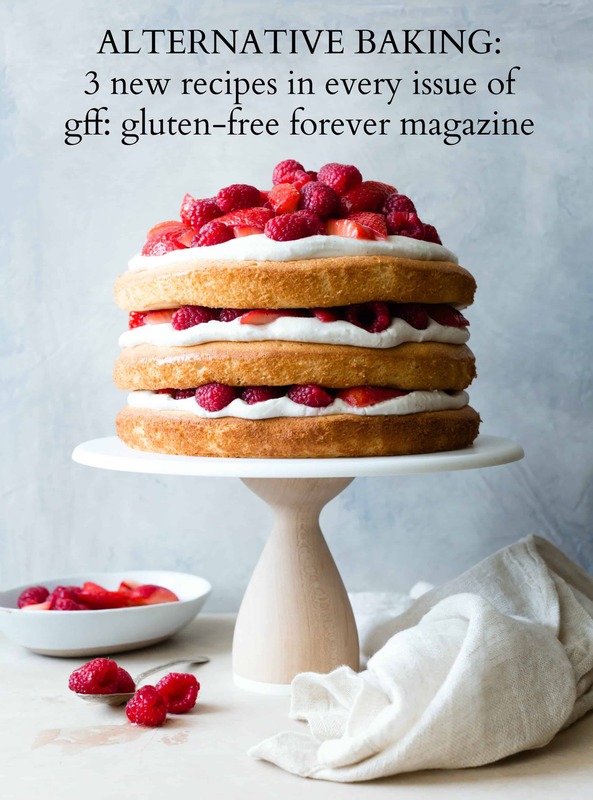 I am gluten free and I am SO glad I found you. Your recipes are amazing! Just adorable! As a chocolate mint lover, these are calling my name! All the trials and testing were certainly worth it because these look amazing!! Oh my gosh, I’m dying over the “temporary insanity era of cooking” line. So true. Glad I wasn’t really subjected to those things. Sounds kind of terrifying. Jello doesn’t belong in every single food item! Lol! These pies are just perfection. I mean, mini anything has me totally swooning. And I love that they are naturally green! Cheers, friend. Miss you and see you soon! XOXO! Ah, yes, the trusty “old refrigerator” flavour of blended mint. Just learned that lesson recently, myself, in smoothie form! These look absolutely gorgeous, Alanna, as always. Thanks for the inspiration! Wholesome, indeed! Such a lovely color! Um, I’m dying to try these. Also, I could hang these photographs in my home, amazing. That matcha mint color just pops off my screen. What a gorgeous dessert! 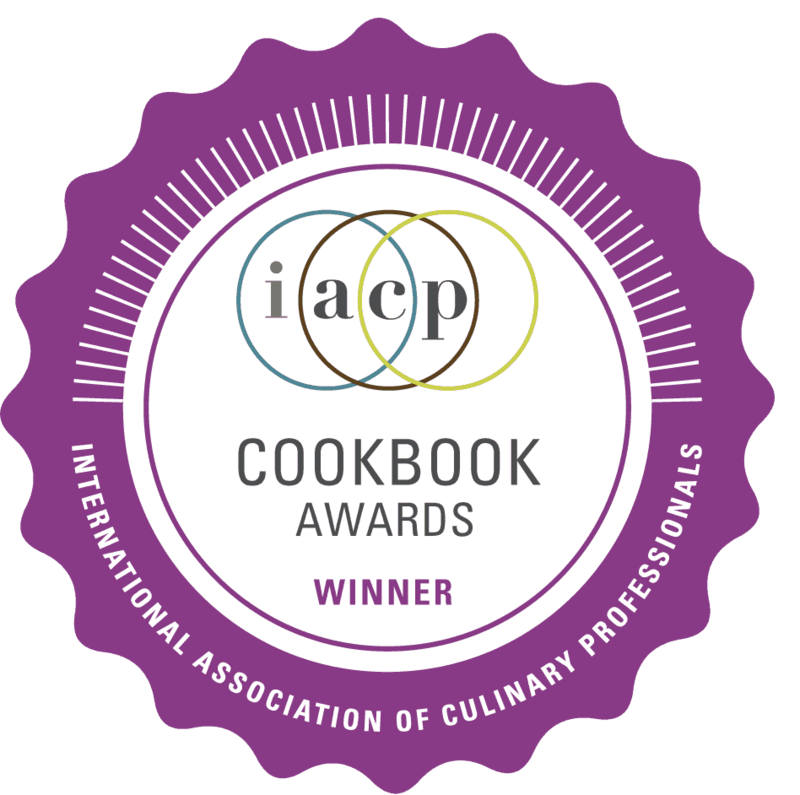 don’t provide us novice cooks with informative tips & tweaks we need! 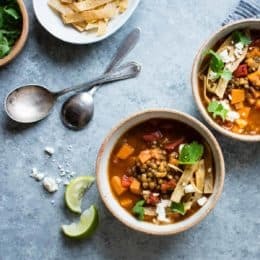 Would I be able to use regular chia seed meal? I can’t find white chia seed meal anywhere except for online, but I’d rather not buy an entire 10.00 bag for just this recipe. Thanks! Ooh I will have to try the other recipe! & yes I love smoothies! I’ll definitely let you know how it goes! I made these a couple of days ago and they are delicious. I also thought I saw a different version of these on your website using greens instead of matcha, but I can’t find them again. Have you done such? Hm, not that I can think of! Maybe it was on a different site?